Football - the beautiful game - may be poetry in motion to some supporters, but one fan is taking the notion quite literally. 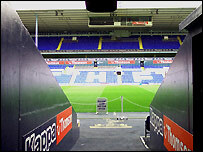 Sarah Wardle, 34, has become poet in residence at Premiership club Tottenham Hotspur, in north London. The published poet and university lecturer produces pieces which are inspired by the club, its ground and the supporters. The role is great publicity for Ms Wardle with journalists wanting to talk to her about this unusual post but she sees it as a way of promoting poetry. She said: "From a poetry point of view, it's been amazing because football is so much part of popular culture in so many ways. "It's a convergence of a kind of religion and the whole business side of the club. It's such an immediate thing. "And I think it's really good to spread the word that poetry is something that is contemporary. "The poetry world knows that but we want people to know that poetry is about contemporary things and there's no subject that poets don't write about." 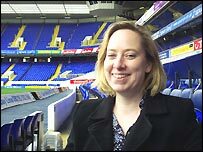 And Ms Wardle's work is reaching the masses; with her odes to Spurs printed in programmes for home games. They have also appeared in newspapers. In return for her poetry, Ms Wardle gets free tickets to every home match. "Being part of the crowd, the excitement and cheering on Spurs, is wonderful," she said. "I really hope I'm expressing the same sentiment in my poems that the fans are feeling." As a lecturer at Middlesex University, just around the corner from the stadium in White Hart Lane, Ms Wardle approached the club last year for help with publicising a poetry festival. It was soon after that the idea of becoming the club's official poet arose. Ms Wardle said: "I'm a fan and my family on my mother's side have long been supporters. I thought it would be wonderful to do some sort of poetry here, and suggested the idea. "They got back to me at the beginning of March and I was absolutely delighted. "This is very much a role at Spurs which reflects all the good stuff that they do in the community." Ms Wardle's not the first poet to join a football club, Brighton and Hove Albion have their very own, who writes under the pseudonym of Attila the Stockbroker and Ian Macmillan is poet in residence at Barnsley. Ms Wardle got the inspiration for her first official Spurs poem, The Injury Room, on the day she collected her pass and took a wander around the grounds. Working close to the ground at the university gives her the perfect chance to pop in to the stadium whenever she likes. "I came down here one afternoon and over the weekend I wrote three or four poems. It's very inspirational," she said. Despite being inspired by the team Ms Wardle loyally says her poetry does not need to have the same effect on them. "The players don't need inspiring. They've got lots of talent, in lots of ways," she jokes - not just referring to their playing. "I'm just so happy the club wants me to write poems for them in this official way." The club plans to run a poetry competition and Ms Wardle hopes she will be able to hold writing workshops at the ground. Her first collection of published poems Fields Away is published by Bloodaxe.